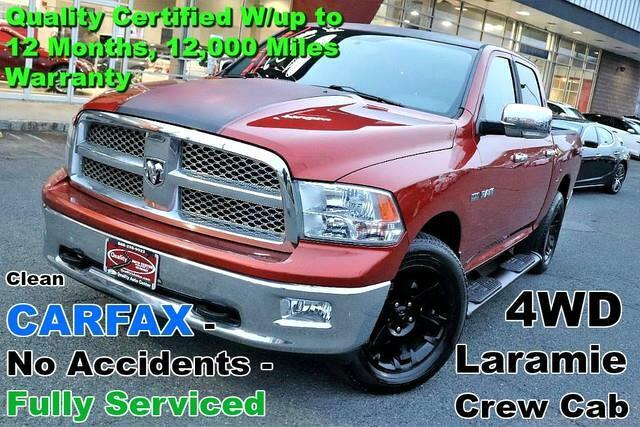 This 2009 Dodge Ram 1500 Laramie is offered to you for sale by Quality Auto Center. Put performance, safety, beauty, sophistication and all the right amenities into a car, and here it is! Now you can own luxury without the luxury price tag! Take home this Dodge Ram 1500 Laramie, and you will have the power of 4WD. It's a great feature when you need to drive over tricky terrain or through inclement weather. In addition to being well-cared for, this Dodge Ram 1500 has very low mileage making it a rare find. Intricately stitched leather and ergonomic design seats are among the details in which test drivers say that Dodge Ram 1500 is in a league of its own More information about the 2009 Dodge Ram 1500: With its distinctive all-new look, the 2009 Dodge Ram 1500 stands apart from the aging face of full-sized competition from Chevy and Ford. Two new, more powerful, more efficient V8s add plenty of grunt to the lineup, and the revolutionary RamBox storage system adds a level of functionality not found in any big Toyota or Nissan. The new Ram 1500 is a step up in the heavyweight truck class. This model sets itself apart with powerful & efficient engines, big towing capacity, excellent off-road capabilities, unique RamBox feature, great warranty, Bold styling, and extensive standard features No Credit / Bad Credit / No Paystubs, No problem !! ! All Approved ! Everyone drives ! CLEAN, GORGEOUS, LOW MILES, SHOWROOM CONDITION. CALL NOW QUALITY CERTIFIED up to 10 YEARS 100,000 MILE WARRANTY , To Certify a vehicle, there will be an additional cost for Certification. CALL NOW For details. STUNNING AGGRESSIVE LOOK ON THIS BEAUTIFUL--Call today to schedule a test drive... Good Credit/Bad Credit/No problem!!!! Get paid cash? No problem!! 100% Credit Approval with interest rates starting at 2.49% for qualified customers, our rates will not be beaten. We price our cars at wholesale price to guarantee the best deals for our customers. Our inventory moves quick, please call to confirm the availability of the vehicle of your interest Springfield location 973-564-0112. This vehicle is located at our SPRINGFIELD location. Come visit our new showroom in Springfield NJ.